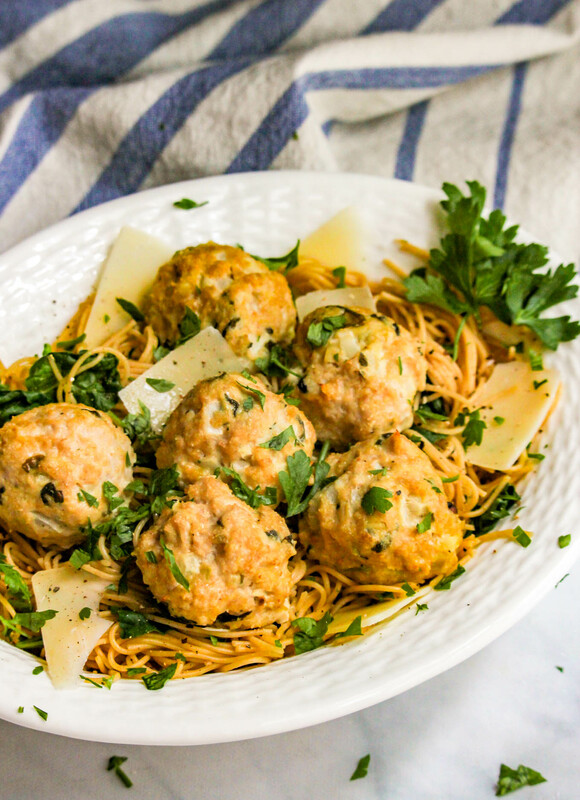 Spinach artichoke chicken meatballs are a really quick and easy dinner recipe with big flavor and just 7 ingredients! 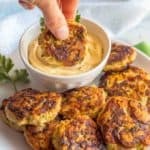 They go great with pasta or can be used as an appetizer. Monday nights have turned into soccer night at our house. J has practice every week and by the time we get home, it’s 25 minutes until their bed time. 🙄 So it’s a mad rush to get the kids cleaned up (which my husband does) and get dinner on the table. 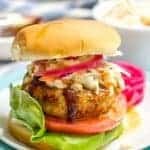 I’ve been using my slow cooker a lot and also stockpiling all my super quick and easy recipes (like my chicken recipes in under 15 minutes). And sometimes making some things earlier in the day when I can. 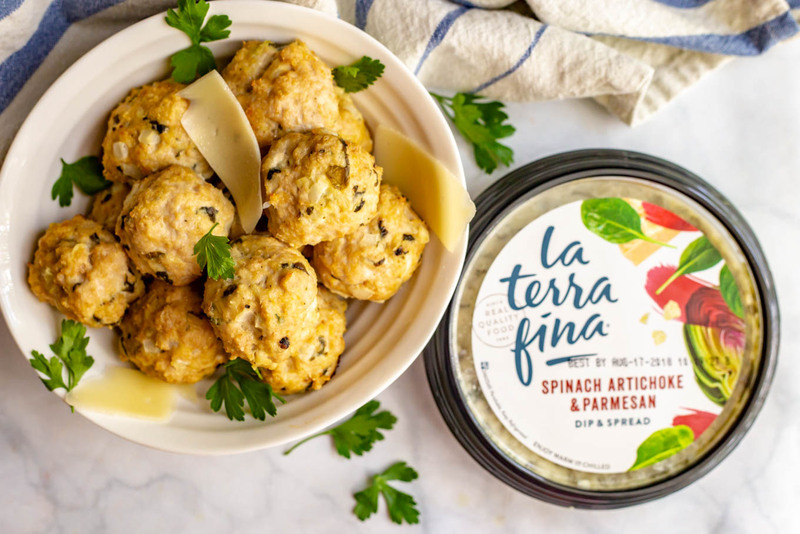 My secret weapon is using La Terra Fina’s yummy Spinach Artichoke and Parmesan dip. We love it both warm and cold with crackers and veggies and it’s a great spread to use for chicken or turkey sandwiches! 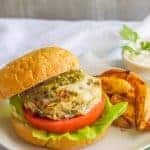 It’s also what I use for my summer veggie pasta salad and my spinach artichoke stuffed French bread, which is a great party or game day appetizer! 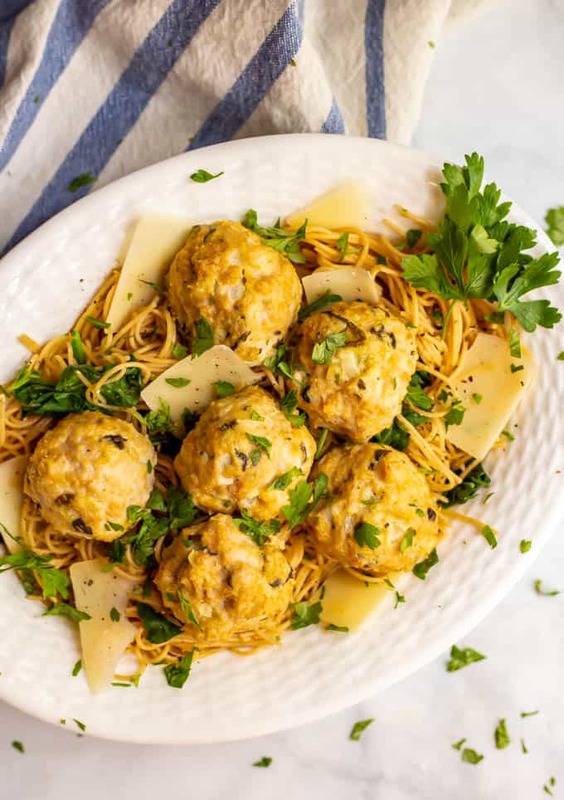 Today, it’s the flavor booster in these chicken meatballs and it really adds such a great creaminess and richness. We love these with a thin spaghetti or angel hair pasta as a main course. I sometimes wilt some spinach in with the cooked pasta for a veggie add-in. Then I give everything a sprinkle of Parmesan cheese and chopped fresh parsley to serve it. Deliciousness! Or you could serve these with marinara and spaghetti for a twist on your regular spaghetti and meatballs dinner. They would also be great as an appetizer – you could serve them with toothpicks and extra of the La Terra Fine dip on the side for dipping! 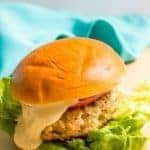 I use lean ground chicken that’s usually 90% or 93% lean, depending on where I buy it. I used La Terra Fina’s Spinach Artichoke & Parmesan dip but their Spinach & Parmesan dip would be great here as well. 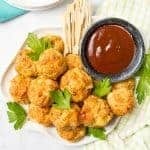 Whether for a soccer practice night or just a busy weeknight, I hope you try these easy chicken meatballs! P.S. 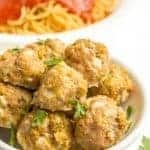 If you are a meatball lover like I am, check out my cheesy chicken meatballs and my easy baked turkey meatballs. 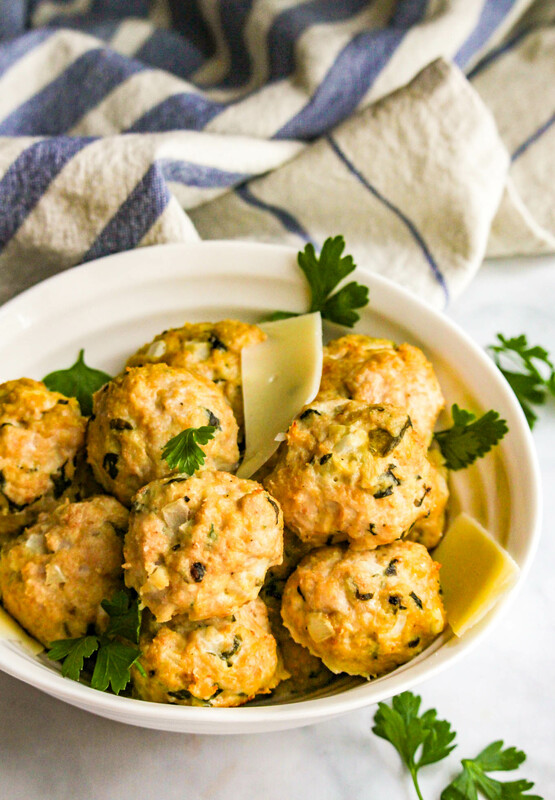 Spinach artichoke chicken meatballs are a really quick and easy dinner recipe with big flavor and just 7 ingredients! These meatballs freeze great! I just pop them in a ziptop bag and throw them in the freezer. I’m all for easy dinners that have this much flavor!! I think all the discerning mouths in the family would like this one! 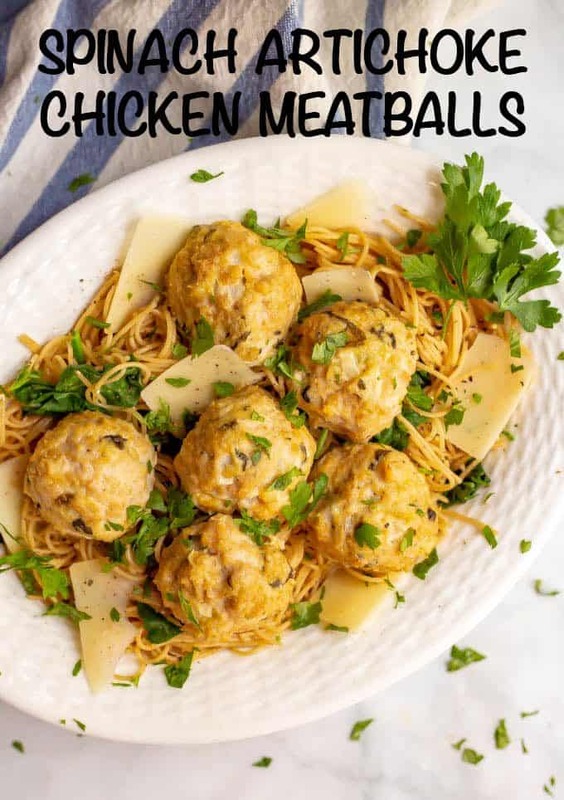 We are meatball lovers in my house and these are always a hit! I hope you enjoy them!